Selling your boat is just like selling your house, you want to present your best. If you are thinking of selling your boat, now is the time to make sure that your boat is clean and those annoying little things that should have been fixed are. Our professional yacht brokers have been selling boats for many years, and are knowledgeable on those exact items that could make or break a sale. 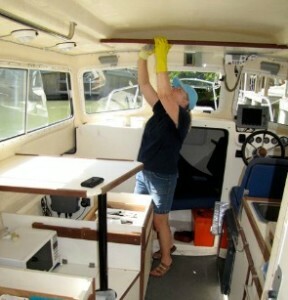 De-clutter and clean your boat. If the carpets and upholstery are worn, it may be worth investing in replacing these items. Again, it will not make your boat worth more than fair market value, but the improvements can potentially place the value in a higher part of the ‘selling range’. A generator that won’t start, or lights that don’t work can be perceived as major issues to a potential buyer and indicative of the overall condition of the vessel. These defects are likely to come up in a pre-purchase survey. If you address these issues prior to putting it on the market, a purchaser would likely have no reason to seek a price reduction from you. Selling your boat can often be a very emotional time for you and your family. As professional yacht brokers we have the experience to assist you to make selling your boat as easy and as successful as possible. North South Yacht Sales has created a number of Boat Selling Tips that will help you get your boat ready for market. for an assessment and evaluation of your boat.